A screening level model was developed for simulation of pollutant migration through the vadosezone and subsequent mixing within the saturated-zone. This one-dimensional finite difference model simulates the transport processes of liquid-phase advection, liquid- and vapor-phase dispersion, sorption, and decay of the contaminant. Using a simple mass-balance technique, the saturated-zone module estimates mixing of the vadose-zone leachate with groundwater. The model can be a useful tool in making preliminary assessments of the potential impacts of contaminants in the subsurface. The model can handle vertical heterogeneity of the soil columns and non-uniform initial contaminant concentration. The model was verified by comparing to an analytical solution and laboratory soil column experiments. Three different soil sample sizes of Ottawa quartz sand and 480 ppm saline water as groundwater contamination were used to be validated successfully in a lab steady state soil column study. The graphical user interface based on the Microsoft Window function was added in the model so that input data preparation and output data visualization processes are automated. 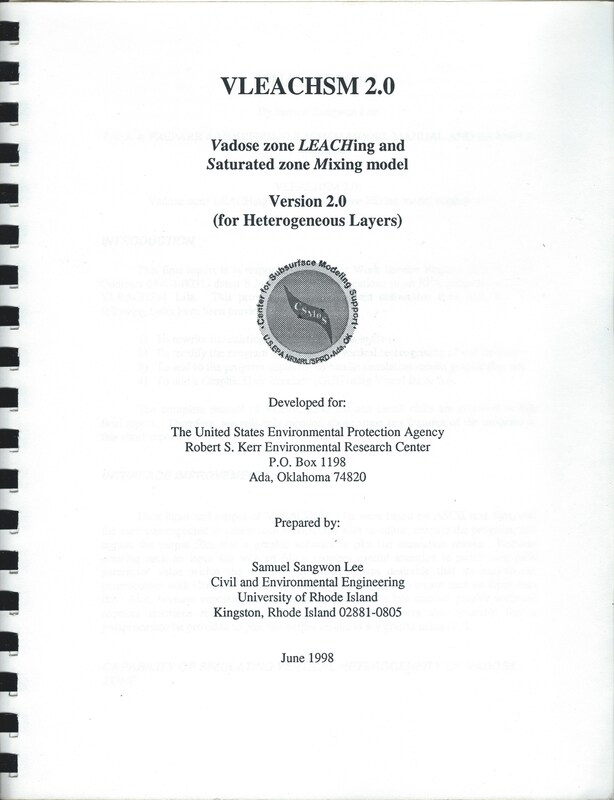 VLEACHSM (Vadose zone LEACHing and Saturated zone Mixing) 2.0 is designed to simulate as a whole the underground aquifer system, including vadose zone and saturated zone. It emphasizes vadose zone contaminant transport and its fate in the saturated zone. 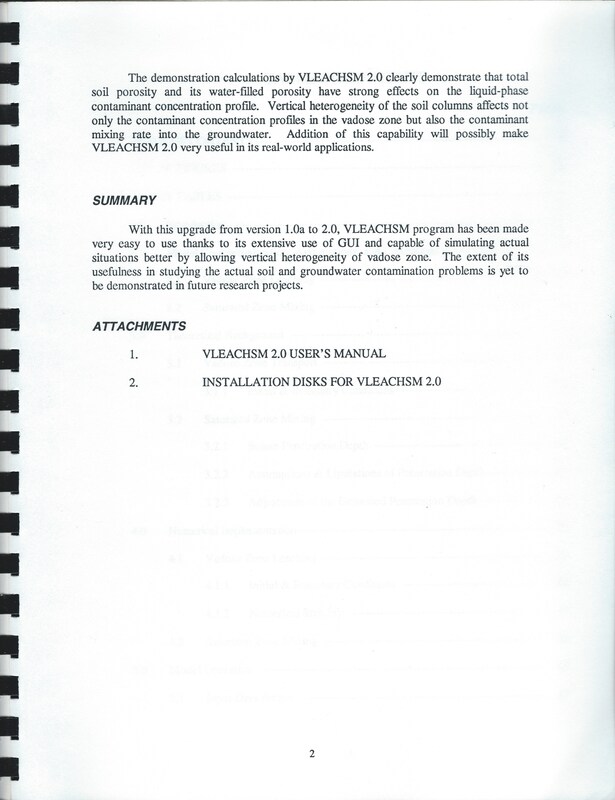 The VLEACHSM 2.0 was developed primarily as a part for a project of the U.S. Environmental Protection Agency Research Program (EPA Contract 68-C4-0031) grant to Dynamac Co. (SI-1-50). 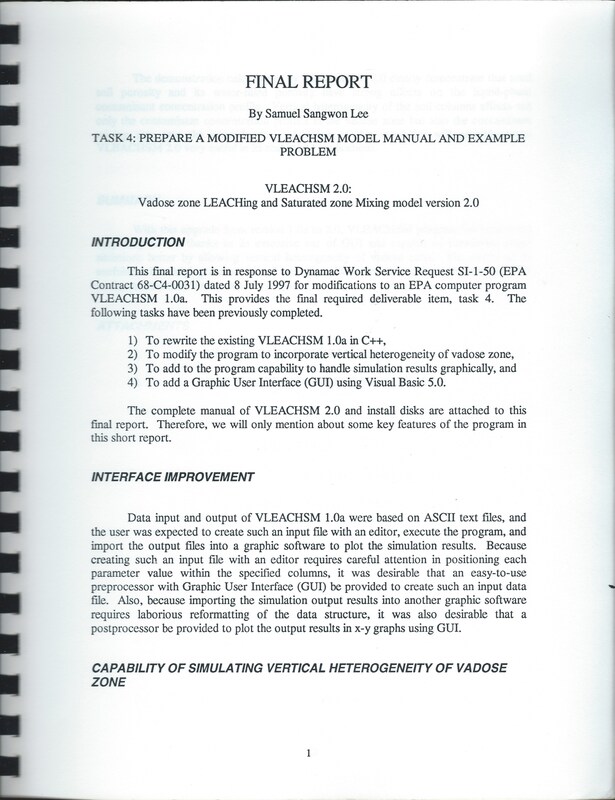 More specifically, this VLEACHSM 2.0 model had the intention of addressing the following three issues: (1) to develop the program to incorporate vertical heterogeneity of vadose zone, (2) to develop the program capability to handle simulation results graphically, and (3) to develop a Graphic User Interface (GUI) for user friendliness. Validation of the model evaluates the performance of the model by comparing the simulation results with the results of the soil lab-column studies and also a field application. A sensitivity analysis evaluates the impact of a parameter of longitudinal dispersivity on soil contaminant level and loading to groundwater. This study is based on the premise the quantitative physical basis of hydrology which is the scientific approach to understanding observed phenomena. The text presents a basic coverage of physical principles and how these allow one to grasp the essential elements of hydrological processes.